The Ferrari 250 GT line of cars is not only one of the longest model runs in Ferrari history – but also the most legendary. What started with the 250 Europa GT in 1954 would cycle through a number of well-known road and race models. 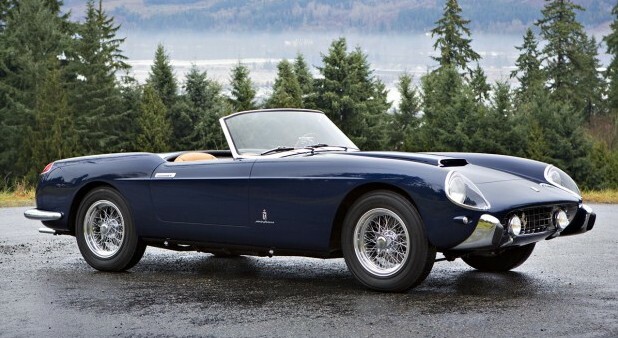 The 250 GT Cabriolet by Pinin Farina would be the first one to lose its top. New for 1957, the Series I Cabriolet from Pinin Farina went head-to-head against the California Spider (which was from rival design house Scaglietti). This car cost almost $15,000 in 1958 – strangely about $3,000 more than a California Spider. The California is worth more than twice as much today. There are differences between the two cars. This one is a little bit softer, the nose a little lower and more aerodynamic. A quick glance at it might fool the unsuspecting, but it is clearly not a California Spider. The engine is still a 3.0-liter Colombo V-12 making 240 horsepower. This car has had just four owners from new and is one of only 40 Series I Cabriolets built (Pinin Farina would build about 200 more “Series II” Cabriolets after Series I production ended in 1959). This car has a pre-sale estimate of $4,000,000-$5,000,000 which is a nice price when compared to a California Spider. And I have to say, I think this car just might be prettier. Click here for more info and here for more from Gooding & Co. This entry was posted in Uncategorized and tagged 1958, 250, 250 gt, auctions, cabriolet, cars, classic cars, ferrari, gooding & co, gt, pinin farina, series i by classiccarweekly. Bookmark the permalink.